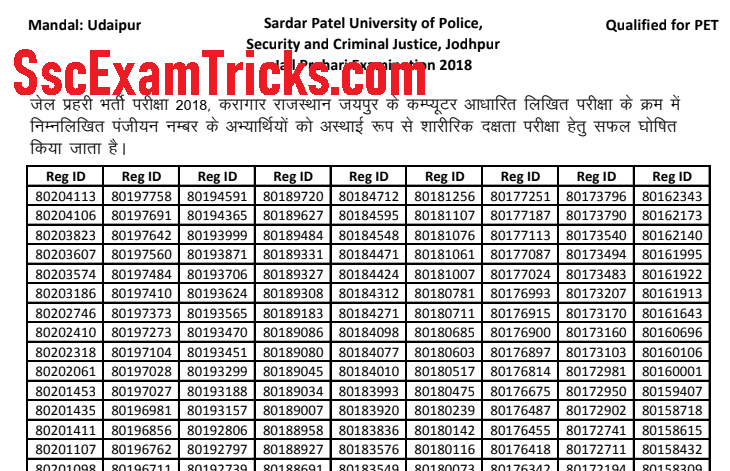 On 24.12.2018 - Rajasthan Jail Prahari Result has been declared now. The list of candidates called for PET/ PST has become available for Udaipur, TSP Mandal, Ajmer, Kota, Jaipur, Bikaner and Bhartapur Districts. Rajasthan JW Result will be available very shortly after the written test. Rajasthan JW written test qualified candidates will be called for PET/ PST in which physical standard test and physical efficiency test will be conducted. The PET/ PST will be held for qualifying nature only. A final merit list will be uploaded with category wise cut off marks. 1. Go to the official website http://home.rajasthan.gov.in/. 2. Go to the Download Segment column and click on ‘Download Rajasthan Jail Prahari Result’ link given at the left bottom of homepage of website. Enter your to be registration number, DOB, Gender and verification code (displayed in the image). 3. 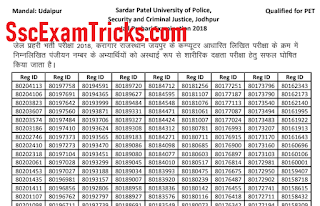 Click on the button given as ‘Download Jail Warden Result/ Merit List’. The Jail Warden/ Prahari Result/ Merit List will be available on official website of Rajasthan Jail Department.